We hear about bureaucracy in dealing with government agencies and insurance companies all the time, but this one is a whopper. Nicole Levy Fiore, a former teacher in Jersey City, is caught in the middle of bungle that involves the Board of Education, two insurance companies, the state’s Treasury Department, and an insurance policy that never should have existed. In practical terms, the mess-up has left Fiore with as many as 40 unpaid medical bills, and she’s expecting to see more. After nearly five months of trying to get a fix on her own, Fiore said she’s losing her patience, and she asked for help. Fiore, 35, was a first grade teacher in at P.S.17 in Jersey City during the 2004-05 school year. At the time, her employer-sponsored health plan was Horizon Blue Cross Blue Shield (HBCBS). She left the district in September 2005, and all the paperwork indicated she was removed from the employee computer system, she said. For the next few years, she worked other jobs with different health insurance plans. In January 2008, she got married and went on her husband’s insurance, which also happened to be provided by HBCBS. Sometime that year — and something Fiore didn’t know until later — the Jersey City Board of Education switched from paper files to electronic files, Fiore said. That was the cause of the impending headaches. In October 2010, Fiore and her husband had a child, and Fiore decided to become a stay-at-home mom. She stayed on her husband’s HBCBS health plan. When her husband got a new job in September 2013, the family switched to a new employer-sponsored plan with United Health Care (UHC). All was well, but it wouldn’t stay that way. Fast forward to September 2014, when Fiore went to fill a prescription at a local drug store. “I was told that I could not because UHC was not my primary and that HBCBS was,” Fiore said. 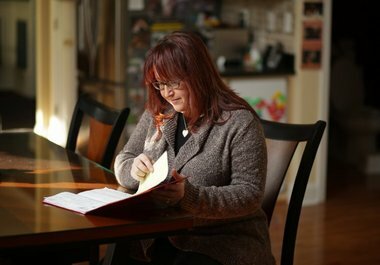 She explained to the store that it must be wrong — she hadn’t been on an HBCBS plan since September 2013 when her husband changed jobs — and she worried someone had stolen her identity, she said. Fiore said HBCBS didn’t notice there were two plans in her name — one wrongly-activated one under Jersey City, and correct one through her husband’s employer. Nicole Levy Fiore goes over the paperwork related to her unpaid insurance bills. 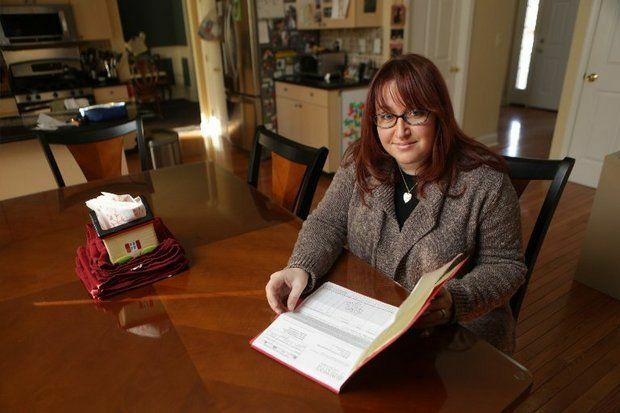 When the error was realized, Fiore said, she started receiving bills from all of the doctors she had seen since September 2013 under her UHC plan. “This is because UHC is trying to rescind the money they paid for each claim during that time period,” she said. Fiore said UHC believes it shouldn’t pay the claims because she had different primary insurance — the old HBCBS plan from Jersey City that shouldn’t even exist. “But since all of my doctors know that I am currently on UHC, they are submitting the bills back to me instead of HBCBS,” she said. Fiore learned that UHC needed a “Certificate of Credible Coverage” from HBCBS explaining what happened, and until then, it wouldn’t be paying any bills for Fiore. But, Fiore said, HBCBS told her it can’t issue the certificate until the dates for her plan are corrected by the state of New Jersey. Since September 2014, Fiore has been working to get the mess cleaned up. 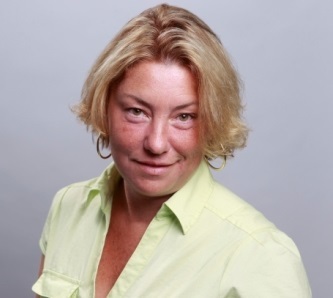 Fiore said she’s been in contact with the Jersey City Board of Ed at least twice a week since then, and finally, in January, it was escalated to Celeste Williams, who works under schools superintendent Francisco Durán. 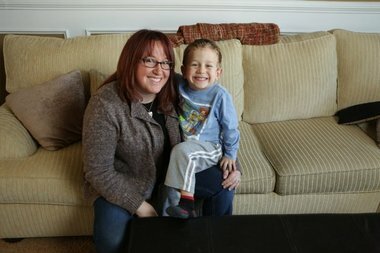 Nicole Levy Fiore and her son Nathan in their Ledgewood home. Williams assured her she would get to the bottom of it all, Fiore said. She said Williams promised to get together with the state to write a letter to resolve the mess. The letter would be sent from the state to the Board of Education, Fiore said she was told, and Fiore would receive a copy. But by Jan. 9, nothing had arrived, so Fiore said she called Williams again. Williams again said she’d send Fiore a copy of the letter, and said Fiore’s unpaid bills could be submitted to the HBCBS plan that was created in error, Fiore said. Even though the plan shouldn’t have been, Williams said it was valid for all those years. Fiore said Williams offered to submit the claims for her, but Fiore said she’d rather do it herself. So for the next two hours, she called the billing departments for each medical provider, giving them the information about the HBCBS account that never should have existed, per Williams’ instructions. Fiore hopes that will work, but she expects more bills to come in as UHC finds more claims it says should have been paid by HBCBS. If that happens, she’ll have to go through the same process. “The state has said that HBCBS must pay these bills because, whether in error or not, the plan did exist, and they must pay. Whether HBCBS agrees or not remains to be seen,” she said. And without a copy of the promised letter, Fiore didn’t know what else she could do. We spent some time going through Fiore’s timeline and all the paperwork related to the insurance mess. Next, we reached out to the Jersey City Board of Education, the state Treasury Department (under which the teacher medical plans fall) and Horizon Blue Cross Blue Shield. HBCBS and the state said they’d review the case, but the Board of Ed didn’t return our calls. Instead, the Board of Ed went straight to Fiore. Hours after we called, via email, Williams sent Fiore a copy of the letter — the letter that didn’t contain the information Fiore needed. But there was no word on the status of letter it was supposed to have given Fiore. This didn’t get her any closer to a resolution. The news was better the next morning. Fiore received a call from HBCBS. The rep said she was going to email Fiore a letter confirming she did have valid HBCBS coverage during the time in question, and that Fiore should send her any unpaid bills from that time period. That makes HBCBS the hero of the day. It fixed a problem that wasn’t of its making, while the Board of Ed, which created the error, wouldn’t return our many calls. Among other things, we wanted to ask what the Board paid in premiums for this mystery medical plan since 2008. We also wanted to know if the health plans of any other former employees were reinstated at the same time. We asked the Treasury Department those same questions, and it said it couldn’t comment on individual employee benefits. Guess those items will remain a mystery after all. Fiore said she’s glad she now has a direct contact at HBCBS who seems to be working for a resolution, and she’s hoping this is the beginning of the end.